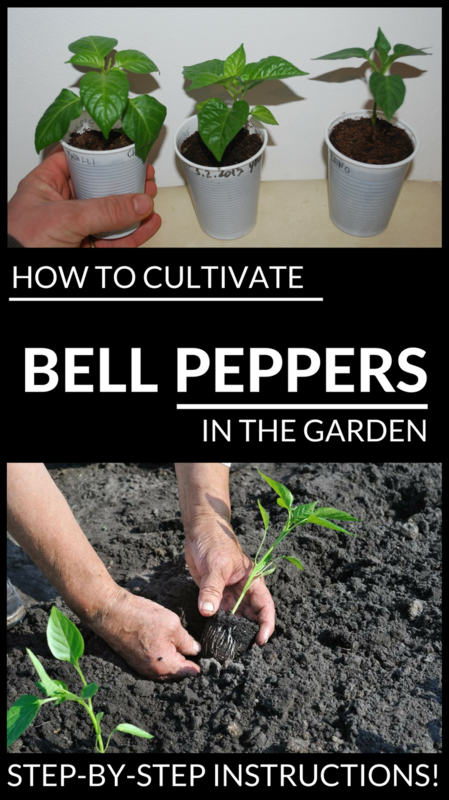 I was wondering if I really know how to grow bell peppers in the garden. What I know for sure is that in order to cultivate the bell pepper I must first produce seedlings. I don’t want to get tired of producing pepper seedlings basically the seedlings can be bought. However, if we want to grow organic bell peppers in the garden, it is better to produce our own seedlings, because we will have some advantages that I don’t intend to write here…I want to focus on growing bell peppers. Who wants to produce bell pepper seedlings finds all the details in this article. Pepper is grown on well-prepared ground. Land preparation begins in the autumn, when about 300 kilos of manure or compost can be incorporated into the soil for every 100 square meters of land before digging. Bell peppers prefer a well-drained soil rich in nutrients. Cultivation of the sweet pepper is done by observing a distance of 70 centimeters and a distance of about 30 centimeters. In order for the strain to grow vigorously, the peppers can grow a centimeter deeper than they were planted in the hedgehog. If we cultivate the bell peppers, we must know that it has claims in terms of water, light and heat. After sowing in the first week the seedlings must be watered daily, later, they can also be wet for 3-4 days. To avoid that the plants to be put to the ground by the first blast of wind, you can add some wooden sticks that bind the stem with a knot in the shape of 8, or two plants can be found in the same nest (they will support each other). Plants placed on poles also have good support when fruits become mature and heavy. Often, to speed up fructification and to create favorable conditions for growing fruits in the cultivation of bell pepper, cut the tip of the plant when it exceeds 60 inches tall. Irrigation in the cultivation of bell pepper is important. When the culture is blooming, you must avoid sprinkling the flowers with water or insecticides; but in this period and in the formation of the fruit the peppers need more water. It grasps the soil more and more, it has many advantages, and it can also be used for the cultivation of the sweet pepper, especially in the garden. Mulching helps to save water from irrigation, protects soil from erosion but I think the most important is that it prevents the growth of weeds. Harvesting of peppers starts in the middle of the summer and continues until late autumn. As a rule, the fruit is harvested at full maturity by cutting the bell pepper with a scissors. Autumn harvest can be done shortly before maturity, peppers stored in a dry and cool place matures even after harvesting.